Just an everyday tale of boy meets girl, boy marries girl, boy has affair with other boy whose sister is having an affair with his wife, said affair being the subject of a thinly-veiled play by the other boy in which all four protagonists perform. Shall we begin? If my extensive knowledge (read: brief Googling) of Swiss copyright law is correct, Annemarie Schwarzenbach’s work enters the public domain today. A few nights ago Berlin’s Dialogue Books hosted A Life Spent Searching: The Travels and Writings of Annemarie Schwarzenbach. The main speaker was historian Alexis Schwarzenbach, great-nephew of the Swiss traveller-writer in question. Annemarie Schwarzenbach’s most famous journeys took her East, but in 1937 she travelled through the southern states of the US, still suffering from the Depression and divided by segregation. 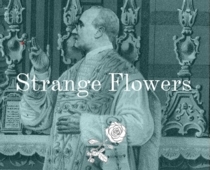 So just for a moment I am going to imagine that Strange Flowers readers have funds as limitless as their curiosity and suggest a trio of attractions in different European locations. Annemarie Schwarzenbach pursued a Tintin-esque existence from the nightclubs of Weimar Berlin to the treacherous shadows of Stalin’s Moscow, from occupied Eritrea to America’s segregated South.